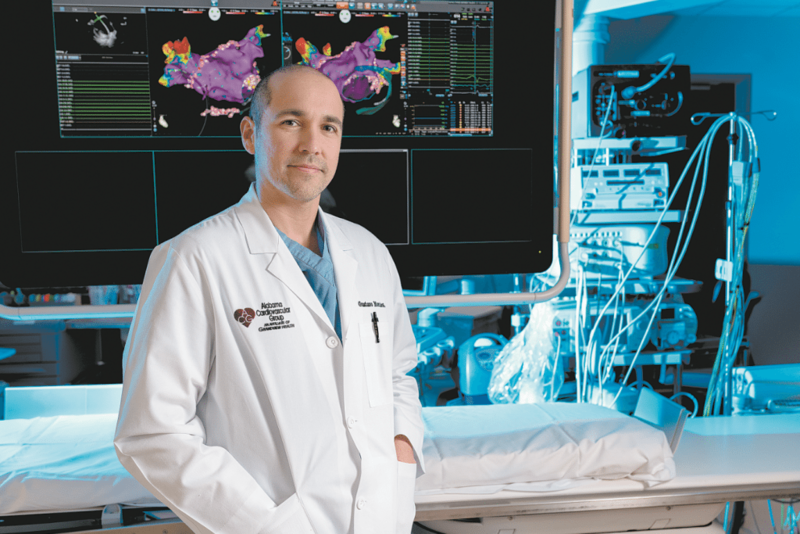 Dr. Gustavo Morales treats patients in Grandview Health’s electrophysiology lab – one of only a few in the nation to be accredited by the Heart Rhythm Society. Journal photo by Lee Walls Jr. Growing up in a family of physicians, Dr. Gustavo Morales said he always knew what career he would pursue. Now, his love of medicine and his interest in the workings of the human heart have brought him to Grandview Medical Center as a cardiologist with Alabama Cardiovascular Group. Morales is board certified in cardiac electrophysiology and cardiovascular disease. “I used to help my father at his work and I was always interested in rhythm problems of the heart,” Morales said. Morales completed years of training under well-known physicians in cardiology and now he is sharing his knowledge and expertise with a wider audience as he speaks at Grandview Medical Center’s Heart-to-Heart lunch and learn seminar. Morales will be speaking about an increasingly common heart condition called atrial fibrillation, or AFib. “People should be aware that this condition exists even though people don’t always feel anything different,” Morales said. AFib is characterized by an irregular, rapid heart rate that can cause heart palpitations and shortness of breath. While the symptoms may seem the same as the effects of a hard workout, true AFib can lead to a stroke or worse. Grandview’s electrophysiology lab is one of only a few in the nation to receive cardiac electrophysiology accreditation by the Heart Rhythm Society/Intersocietal Accreditation Commission. Morales is using this lab and other resources at Grandview to further treatments for AFib and help increase quality of life for his patients. His talk at the Feb. 23 lunch and learn will center on emerging methods of treatment and prevention. Morales has helpful tips to prevent heart conditions such as AFib. Some are familiar such as diet and exercise, but he also suggests people take a much longer and broader approach to staying heart-healthy. “Risk factors for AFib are cardiovascular age, high blood pressure and cholesterol, but we don’t want people to be thinking about these things after it is too late,” he said. Morales said it is never too early to take care of one’s heart and, he emphasizes, to be a role model to young people. Morales said in autopsies of children as young as 10 who have died from other causes, experts have seen early signs of heart disease. For his part, Morales said he works to help AFib patients prevent strokes and control symptoms. Taking blood thinners is one way to decrease the risk of a stroke, but Morales said catheter and other procedures to restore correct heart rhythms are advancing. Morales’ talk is the first in a year-long series on heart-related topics. Experts from several cardiac specialties will speak throughout the year. The free seminar begins at noon Feb. 23 in the conference rooms at Grandview Medical Center. Seating is limited and registration is required. To sign up, call 971-7474.